I just finished watching the UFC 87 PPV and the fights were just as impressive as the first time I saw them, which was live at UFC 87. 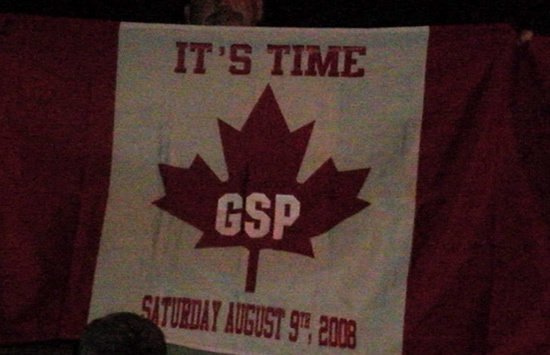 I had a chance to attend my first UFC event and spent the first 6 fights watching from the front row (Matt Serra’s seat) and row 4 (my seat) for the other fights. 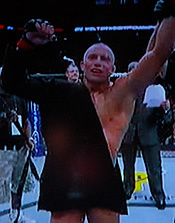 It was truly impressive to see GSP in person, as he looked like a mini-hulk. But watching him dominate Jon Fitch for 25 minutes was even more impressive, especially being able to take down and control Fitch pretty much as he wanted. Brock Lesnar notched his first UFC win as he dominated Heath Herring for their entire 3 round fight. Lesnar charged out of the gate with a flying knee that missed, but seconds later caught Herring with a laser right to the face, knocking Heath to his back. Herring would have no answers and Brock gave the hometown fans something to cheer about, after another Minneapolis resident Roger Huerta was defeated by Kenny Florian, in what was another great fight. I’ll be posting my pictures from UFC 87 later today, take care and check out all the news on UFC 87. Website looks awesome. I was there as well but not in the booth with Rogan like you. Great pics.